If you purchased or received a potted Easter lily as a gift, you may be wondering how to care for it now. This is a guide about caring for potted Easter lilies. 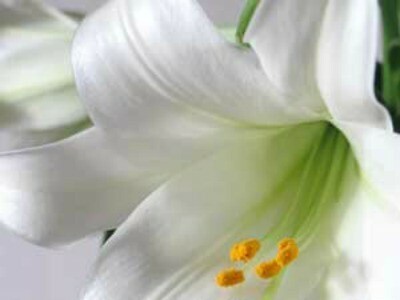 Next to Poinsettias, Easter lilies are perhaps the most recognized flower in the western world. Now that Easter's come and gone, there's no need for your lily to fade. With the proper care, and Easter lily can flower for a month or more before transplanting easily into the garden. Here's how to keep yours growing. 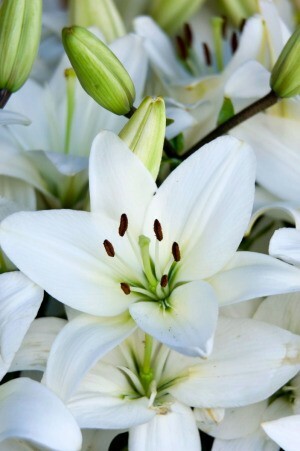 Remove the Anthers: As the flowers start to mature, remove the lily's yellow anthers before it starts to shed pollen. This will keep the petals white and give the flowers greater longevity. Discard the Decorative Packaging: If your lily came in a paper or foil sleeve, remove it-preferably as soon as you get the plant home. Plants kept in these sleeves deteriorate faster and tend to get water logged. Protect it From Bright Light: Lilies kept in direct sunlight are almost certain to die quickly. Place yours in a room full of natural daytime light, but keep it out of direct sunlight. Keep it Cool: Daytime temperatures of around 60° to 65°F will keep flowers lasting longest. You can place the lily in a cooler room (such as a porch) at night or on the floor provided it's kept out of reach of pets. Avoid placing the plant near drafts or heating ducts. Keep its Feet Moist (Not Wet): The soil should be kept lightly moist as long as your lily continues to flower. Check moisture levels daily in the morning. If the surface of the soil feels dry to the touch (just the surface), take the plant to the sink and give it water until the soil is completely saturated and water starts to drip through the drainage holes in the pot. As flowers fade and petals start dropping off a stem, use a sharp pruning shears to trim the stem by lopping off the blossom. When all the flowers have been pruned, the lily should be moved into a room that has some morning sun and afternoon shade. Give it a balanced (20-20-20) half strength water-soluble fertilizer every two weeks to promote the growth of foliage. Easter lilies can be grown indoors indefinitely, but it's difficult to get them to bloom a second time if they spend their time inside. As soon the weather warms, move the pots to a sunny location outdoors and begin to harden them off if you want to transplant them to the garden. After all danger of frost has passed, select a sunny location for transplanting your lily-one protected from the wind and in warm climates, protected from extreme heat. Make sure the soil contains plenty of organic nutrients, has a neutral to slightly alkaline pH and above all, it has good drainage. If necessary, create a raised bed area by mounding up the soil to ensure proper drainage. Plant the bulbs 6 inches deep (3 inches below ground level if you mound up three more inches of topsoil), spacing each bulb 12 to 18 inches apart. Make sure to dig a hole wide and deep enough to allow sufficient spreading of all the roots. Work the soil around each bulb to eliminate air pockets. Cover them with soil and water thoroughly. New growth will start to emerge as the old stem dies back. You may get lucky and see a second bloom this season, otherwise be prepared to wait until next summer (or the right conditions). When stems turn brown and die back in the fall, cut them down to soil level. Apply generous layers of mulch over winter, removing it carefully in the spring as the new growth emerges. Fertilize new growth monthly with a balanced fertilizer applied at half strength, or apply a slow release once in the spring. Discontinue fertilizing when plants flower. Many species of lilies, including Easter lilies, are extremely toxic to cats-even in small doses. 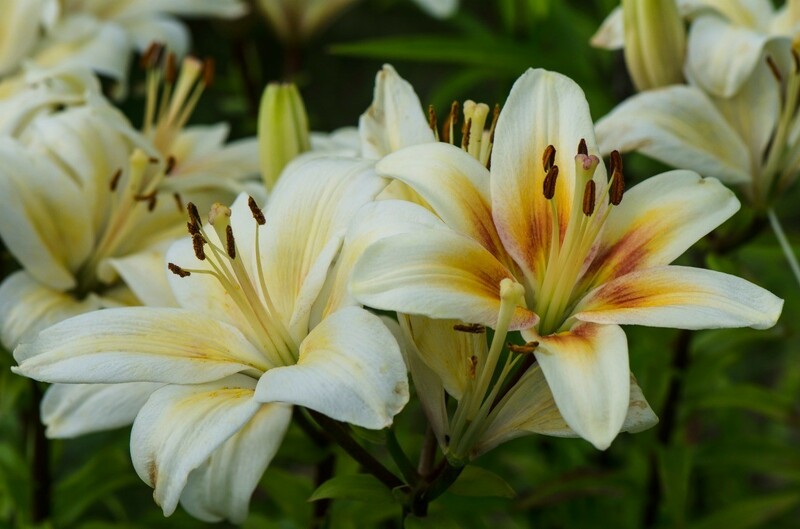 These include Easter lilies, Tiger lilies, Rubrum lilies, Japanese show lilies and Day lilies. Keep potted plants away from your cats and keep you cats away from the lilies you transplant outdoors. If you notice your cats eating lily leaves or stems, seek veterinary attention immediately. My friend has the most beautiful bright pink lilies in her garden. After her white Easter lilies died off, she saved them for the following spring. She planted them and they grew anew as gorgeous pink lilies. Easter is nearly here and I wanted to remind cat owners that Easter lilies and many other types of lilies are very poisonous to cats. Three or four petals can cause irreversible kidney damage. My Easter lily is droopy and the leaves are turning brown. What is causing this? Is it over watering? Could be many possibilities-insects, mold or fungus, nutrients missing in soil, etc . Usually, though, overwatering is the culprit. Lilies are bulbs and once they bloom, they die back every year. That is probably what is happening. Daffodills do the same. You can dig up the bulbs and store them to plant again in the fall or leave them and they will come up next Spring. Question: What Is Growing in My Easter Lily Pot? 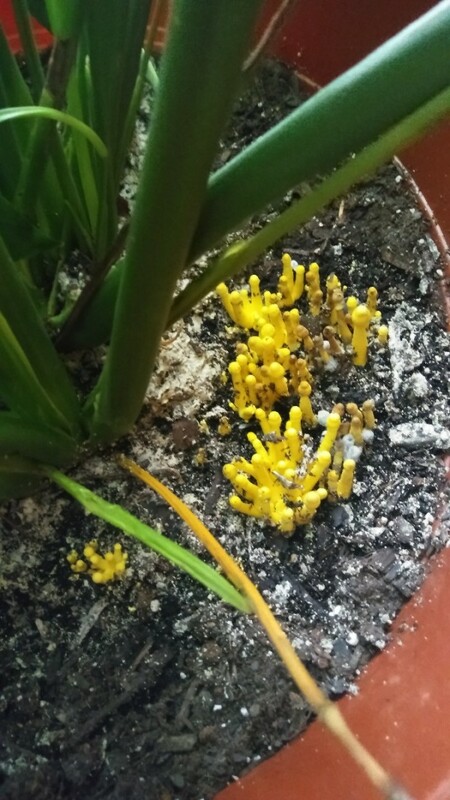 I have these growths happening in my Easter lily pot. It's kept in the house. What is this and is it normal? Looks like you have mushrooms growing in your pot. These are not always easy to get rid of but here is a link that has information on how to handle these pretty little things. Hello ! It is only fungi and it is not dangerous for the plant. Fungi need moisture and darkness to start growing. You could water less, scratch the soil surface to air it and bring the plant in full sunlight where Easter lily can grow. If the plant is in half shade at the moment bring it into full sunlight gradually to give the leaves enough time to adapt. Fungi can't propagate in full sunlight. Happens frequently in houseplant soil. Pull the yellow fungi and change the soil. I received an Easter lily as a present. I have looked for information on how to care for it indoors, but I keep seeing that after some time they have to be planted outside. I currently don't have any space to plant outside. How can I keep the Easter lily alive and well while keeping it inside in a pot? I have an Easter Lily I have has for 3yrs. now and it is living in a pot in my bathroom. It have morning sunshine and afternoon partly shaded. it is about 3feet tall and doing good. It has a lot of TLC but I water it when the soil feels dry about 1 in down inside the pot ( every other day). I give it no special care and it is doing just fine. how do you stop an Easter from growing before it's time and to stop before it chokes out the second plant that is beginning to grow? The first one has grown so big that just has leaves and no flowers I live in an apartment, and don't have a place to plant it outside. It is still in its original pot. I need an answer quick! Thank you for understanding. I've been given three Lilies for Easter. Once they die back, can I plant them in my yard? How do I go about it? Will they survive and come up again? Would really appreciate some information to keep them going. I have a potted Easter lily from last year. I trimmed it once it died. It had two bulbs this year, one which popped off and died. Now the other is beginning to grow leaves and they are beginning to turn yellow. I am trying to have this plant bloom this year, but I'm afraid it's not gonna make it? Anyone have any tips or could tell me why this is happening? The leaves are also growing to one side to catch the sun and seem to be flopping down. What can I do for this plant to make it grow strong and healthy? The Easter lily that I bought last year has a nice fat stem, and three little skinny stems. Should I separate them, if so how? Like most overcrowded perennials, Easter lilies are best divided in the fall. This is a guide about dividing Easter lilies.